Neurological disease is a major cause of disability and death across the world. There is increasing evidence that palliative care is effective in managing symptoms, maintaining and improving quality of life, and helping patients and families cope with the deterioration. As the disease progression varies, both between diseases and for individuals, palliative care may be involved for varying periods of time, and may need to be involved episodically throughout the disease progression. Careful assessment of all the issues – physical, psychosocial, and spiritual – will allow appropriate management and support for patients and families. Carer support is very important as families face all the issues of coping with a progressive disease. Recognition of the later stages of life is helpful in enabling patients, families, and professionals to be able to prepare for the dying phase and manage all the issues appropriately. Alzheimer’s Society. http://www.alzheimers.org.uk/site/scripts/documents_info.php?documentID=412. Accessed 26 July 2015. General Medical Council. End of life care: glossary of terms. 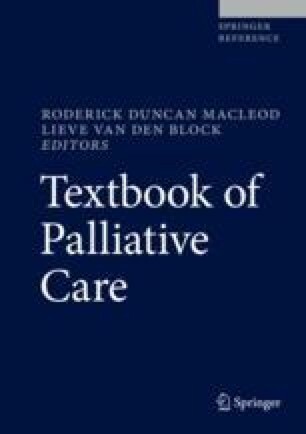 Available from: http://www.gmc-uk.org/guidance/ethical_guidance/end_of_life_glossary_of_terms.asp. Accessed 8 Feb 2017. GSF, G.-S.-F. Proactive identification guidance. 2016. Available from: http://www.goldstandardsframework.org.uk/library-tools-amp-resources. Accessed 8 Feb 2017. NICE. Parkinson’s disease in over 20s: diagnosis and management. 2006. Available from: https://www.nice.org.uk/guidance/cg35. Office for National Statistics. 2012. www.ons.gov.uk/ons/rel/vsob1/mortality-statistics-deaths-registered-in-england-and-wales-dr/2012/dr-tables-2012-xls. Accessed 21 July 2015. Thomas, K. and J. Armstrong Wilson. The Gold Standards Framework Proactive Identification Guidance (PIG). 2016. Available from: www.goldstandardsframework.nhs.uk. Accessed 8 Feb 2017.